Similar in concept to the Inner Sphere's Hawkmoth as its name suggests Donar is a light Combat VTOL that excels at softening an enemy and outmaneuvering any return-fire. The Donar was originally commissioned to provide quick fire support, its missiles are effective at exploiting the holes that its laser can open up. The Clan's version of Eyes in The Sky also comes with various arrays of electronics. Donar in Canon is 21 tons, but in Drops the Donar is usually rounded up to 25 tons. The Donar Prime carries a Extended Range Large Laser backed by two Streak-SRM4. It can harass light Mechs and tanks at range, while also being a good choice for hit-and-run tactics by flying just close enough to lock the Streak SRMs, fire and run away. EOptics, BAP in combination with C3 make the Prime one of the fastest scout units in the game and provide some much-needed utility. Communications with this unit is key. The Donar A trades firepower potential for utility. While still able to contribute to the fight with a single respectable Large Pulse Laser and four Machine Guns, this VTOL's highlight is in its radar support. The C3 Radar relays your radar intel to teammates, and the Beagle Hound Probe extends the range of your already impressive radar even further. With the additional TAG laser, there's options to transmit the details and location of even radar passive enemies back to your team, while guiding your allies missiles as well. The Donar A can even challenge other VTOLs from a distance, whittling them down with sustained Machine Gun fire (which Aerospace units incur a extra damage from) all while remaining close to friendly lines. Mounting two Extended Range Medium Lasers, four Extended Range Small Lasers and a NARC with one Free Ton NARC ammo, this is the Clan version of the Hawkmoth F, although with more sustained damage output. The Donar B's NARC has a maximum range of 700m, requiring it to take the risk of being fired upon in order to paint targets. However, it can fire its lasers on the target while doing so, and achieving NARC lock may be easier than holding a TAG laser steady for some pilots. 3 DHS should take care of the heat generation. The C is a very Short range heavy hitting fighter. The highlight of this VTOL is the 5 rapidly reloading racks of Streak-SRM2 will keep any foe's screen permanently shaken if chain-fired. The Donar C is a great asset for incapacitating high-value enemy assets all while blasting them down with three Small Pulse Lasers. 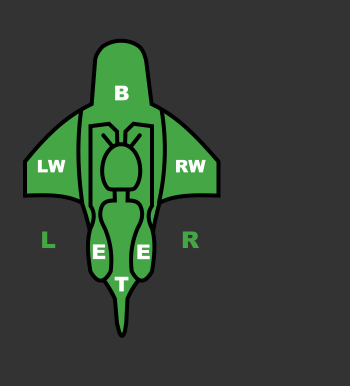 However, it takes a skilled pilot to both read the battlefield and maneuver close enough, and long enough to start delivering your salvos safely- since the Donar C has incredibly short range, and almost nonexistant armor like the rest of the VTOL family. The GECM does aid in this front, in reducing its radar signature and allowing for more stealthy maneuvering. This Donar Variant absolutely demolishes enemy VTOL assets that are foolish enough to find themselves within its range. The Donar D sports one Medium Pulse Laser which is reasonably heat-efficient for the damage it causes. Though once it drops into the 300 meter range the onslaught of two racks of High Explosive ATM6 with Devastating Power and Screen Shake due to it's staggered launching pattern. Like the Donar C, this is the second unit to house GECM. With only 1 DHS watch your Heat when firing the [HE]ATM. Tanks, Heavy and Assaults should be on your watch list. Three weapon systems in almost the same range, two SRM6, a Heavy Medium Laser and two Heavy Small Lasers, but only three DHS. Care should be taken not only for the Heat Build-up but the FaceTime needed for the Lasers. This could almost constitute Kiting as an action to lay waste of your prey. Just be certain of your surroundings. This variant's two Standard ATM-3 launchers can be utilized to keep damage output up even during evasive maneuvers with their tracking and generous range. Softened enemies quickly fall under the focused beam of a Heavy Large Laser. With only two Dual Heat Sinks to manage your internals with, constantly throwing ATM salvos and Heavy Laser Beams will quickly overheat your VTOL- so keep a mindful eye on that temp gauge. The EOptics enables a zoom of 2.5x for spotting/reporting to your team, but also allows for pinpoint accuracy when focusing damaged components with your Laser. The combination of one Lubalin Ballistics-X AutoCannon 10 and four Machine Guns make this a devastating foe to both enemy Aerospace and Tanks especially, but can easily shred light and medium mechs alike with its additional pair of SRM-2 launchers. It's respectable damage output and forgiving range makes it a favorite of both novice and veteran VTOL pilots. However, the lack of any free tons to store ammunition severely limits this VTOL's effective presence on the battlefield- especially considering how this variants entire arsenal needs to be exercised in order to realize its full potential. The Donar is a Clan VTOL added with the release of MWLL 0.6.0. Donar was designed as a fast attack unit capable of providing long-range fire support. 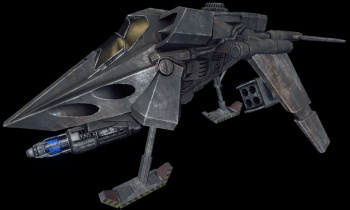 Operated by two pilots - gunman in front and a pilot/navigator in the back, the Donar was heavily armored for it's class. 3 tons of ferro-fibrous armor protect the hull very well, though the rotor cannot mount enough armor to ensure it's survivability for hits above 40mm caliber guns. Weapons of the Donar are synchronized with the helmet allowing the gunner to pick up targets quickly and efficiently. Donars are used both as front-line cavalry VTOL or as scouts. This page was last edited on 12 March 2019, at 22:01.